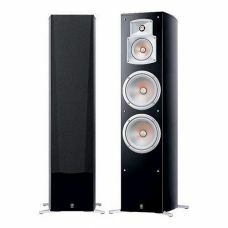 The Yamaha NS-777 250W Floorstanding Speaker (Single, Black) is a 3-way floorstanding speaker. It has dual 8" woofers, a 5" midrange driver, and 1" Aluminium Dome tweeter. The system features a Highly Oriented Polyolefine design for improved transient response, higher power handling, and flatter frequency response. The speaker is magnetically shielded to allow placement near a TV without distorting the image. A better material for better sound. The dynamic range of Dolby Digital sound tracks places stringent demands on the speakers that reproduce it. That's why they developed an exclusive loudspeaker cone material: Highly Oriented Polyolefine (HOP). It's extraordinarily strong, yet amazingly lightweight (up to 30 times more rigid, per unit weight, than polypropylene). You get dynamic sound with low distortion and extraordinary transient response. HOP cone material combines high strength, low weight and low resonance, resulting in improved transient response, higher power handling and flatter frequency response. With the Dolby Digital system, the surround channels are reproduced in full stereo, with the same full frequency response and dynamic range as the front. These receivers are built with just as much power to the surround channels as to the front. And that's why their speaker systems offer the same quality, front and rear. Speakers placed too close to the TV can cause the pictures to bend and colors to bleed. That's why these bookshelf, floor-standing, front and center speakers all incorporate magnetic shielding. It cancels out magnetic fieldsand resulting interference. You can place the speakers anywhere - even directly beside your TV - without picture distortions and degradations.